Before we left, I made a promise to myself that I would write down all my expenses. This benefits me in a few ways: I can see where all my money has gone, I can more practically budget for travel in the future, and I can share my findings with others so they have an idea of what to expect. I came across someone's Excel sheet like this while I was planning my trip and it helped me a lot, so I wanted to do the same thing. 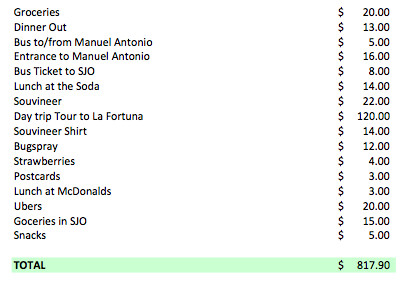 Admittedly, I probably did forget some items, but all of the big expenses were definitely accounted for. All in all we spent about $26 per person, per day and came in about $200 under our budget. Costa Rica was more expensive than we expected but we watched what we spent and stayed within our budget! I will continue to do this for the rest of the trip so you can follow along if you wish. If you have any ideas for posts or things you'd like to know feel free to comment below! I had a request for a map of where we have been and where we are going, so I will be working on that! I also will write a post on Panama here shortly. It's hard to post on a schedule when you are traveling, so thanks for being patient! Adventure on!